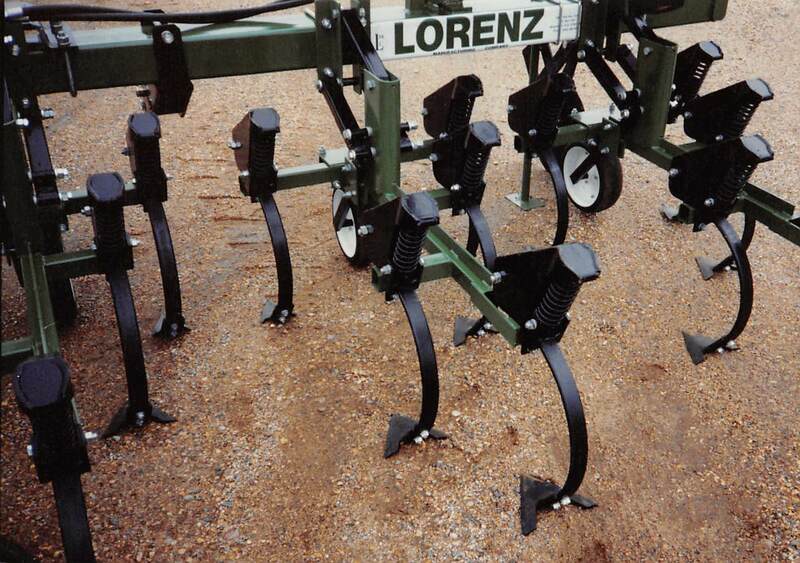 The Lorenz Mini-Utility Cultivator is designed for use with Category 1 tractors. 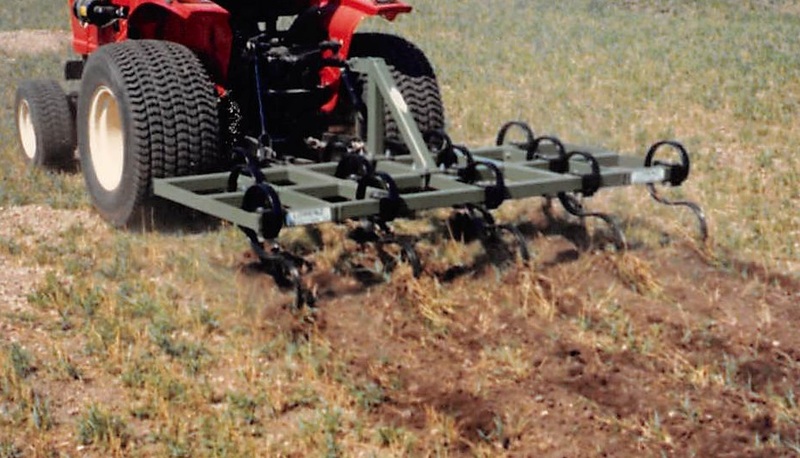 The Cultivator is an excellent tool for working acreages, gardens and tree claims. 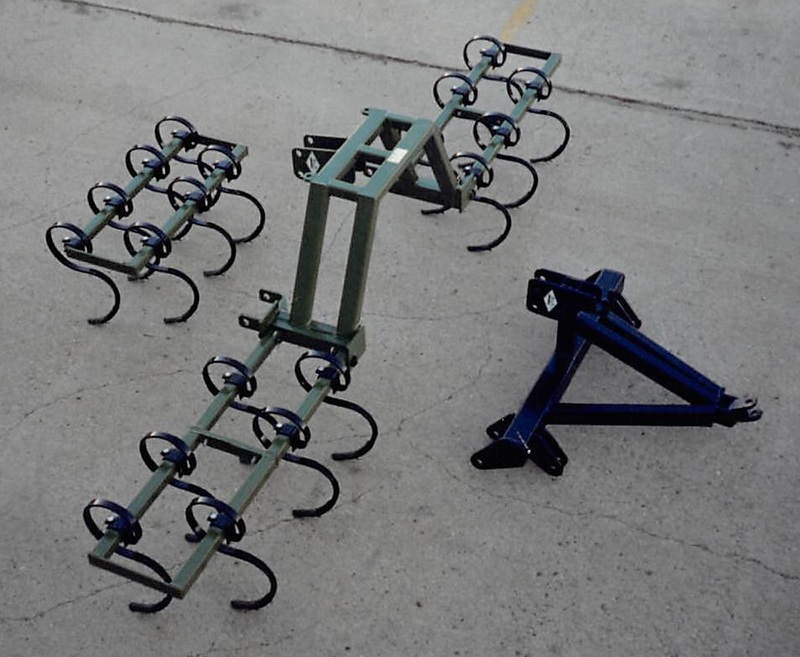 Nurseries and Landscapers find the sturdy Mini-Utility Cultivator ideal for preparing yards for seeding or landscaping. 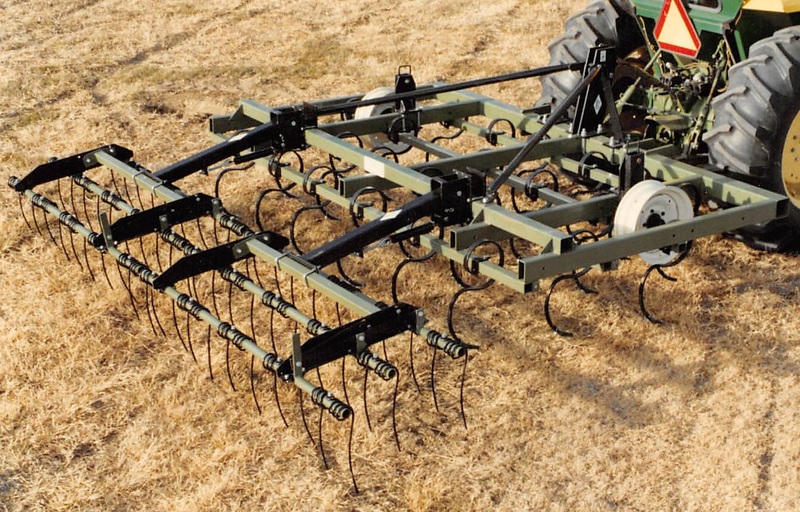 Tines may be removed or set at different spacing to adapt to row crop cultivation in a garden or sweet corn patch. 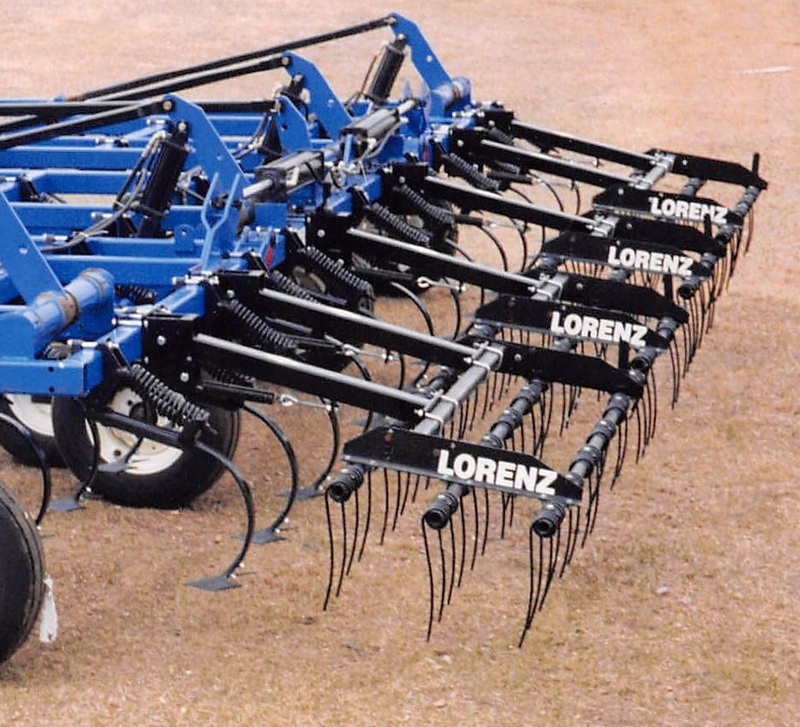 Whatever the need, this durable Lorenz cultivator offers you an effective means of cultivation even in trashy conditions. - Category I 3-pt. 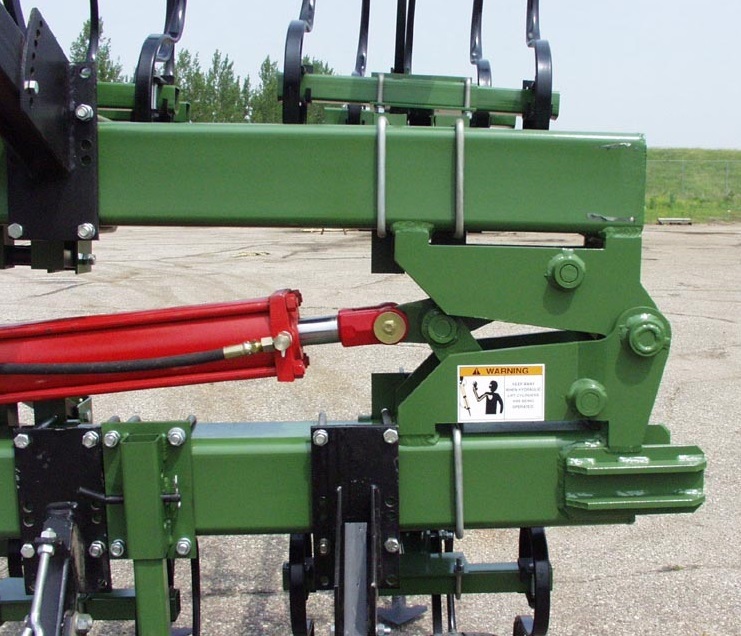 hitch - quick hitch adaptable. 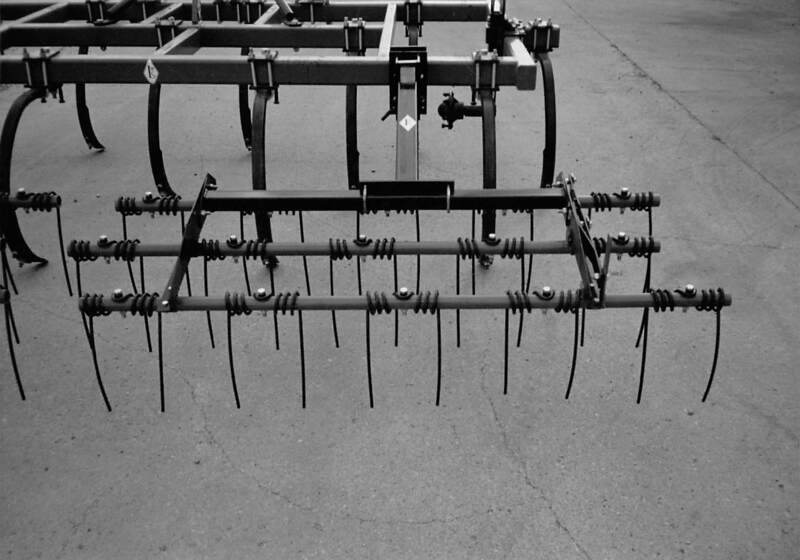 - 4 ft. basic main frame, with 1 ft. and 2 ft. extensions. 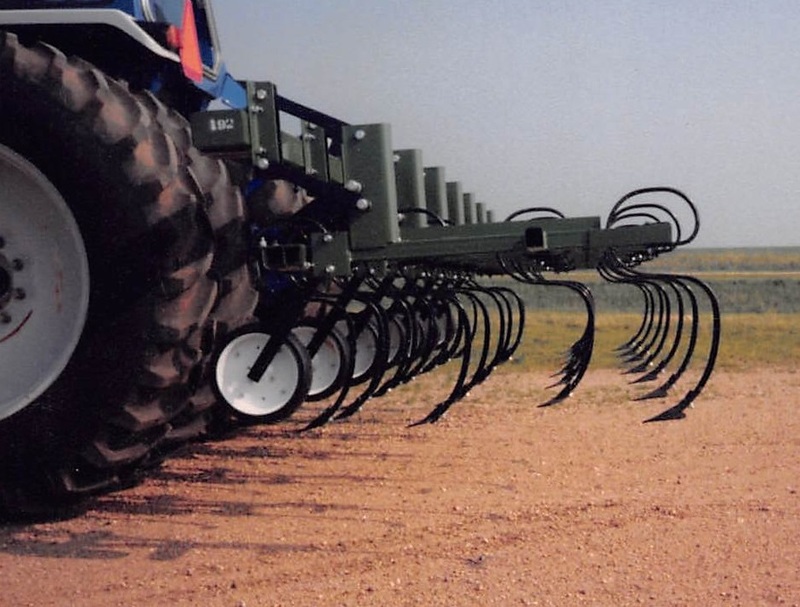 - 3 ranks of standard Danish Springtines, optional heavy duty Danish Springtines available. 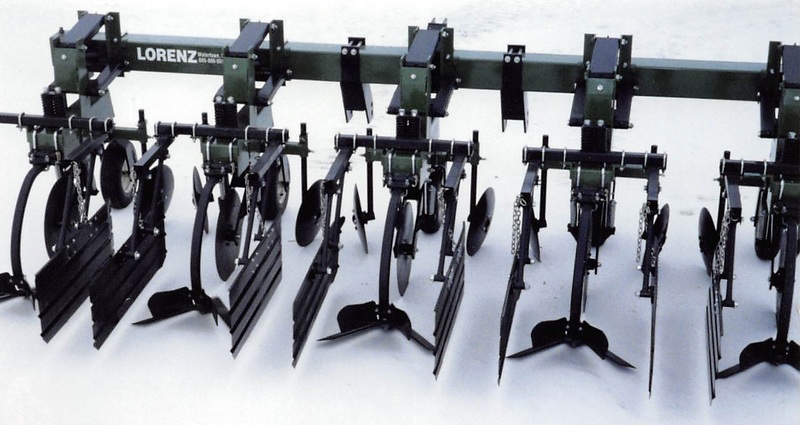 - Equipped with 4" shovels, optional 1 3/8" reversible point, 2 3/4", and 7" shovels available. 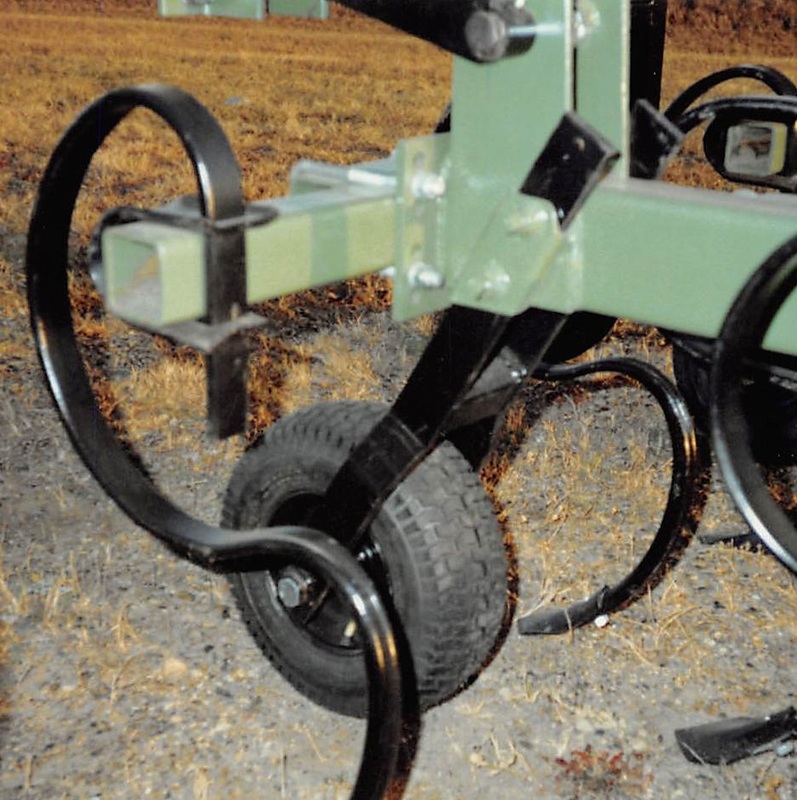 - Available with optional mounting bar to accommodate tine harrows or single rolling baskets. 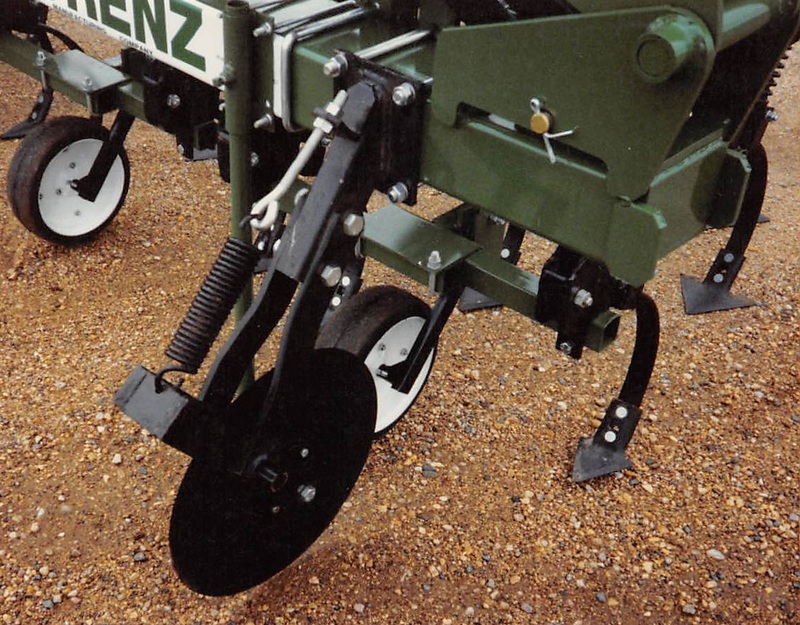 The Lorenz non-folding Wac-A-Trac and folding Wac-A-Trac II can pay for themselves in the first season of use by reducing water run-off and eliminating 'canals' from tire tracks. The result is proven higher yields. 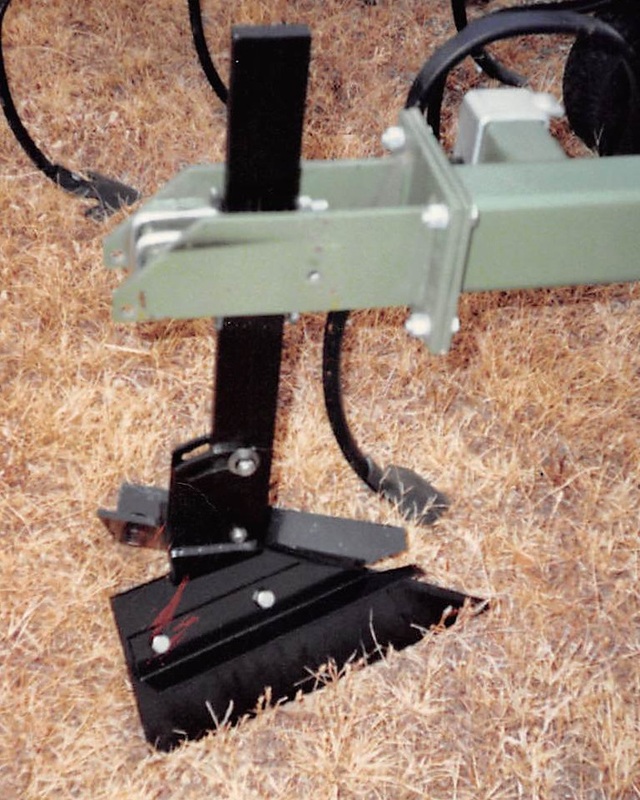 The Wac-A-Trac covers widths from 7 ft. 6 in. to 15 ft. 6 in. 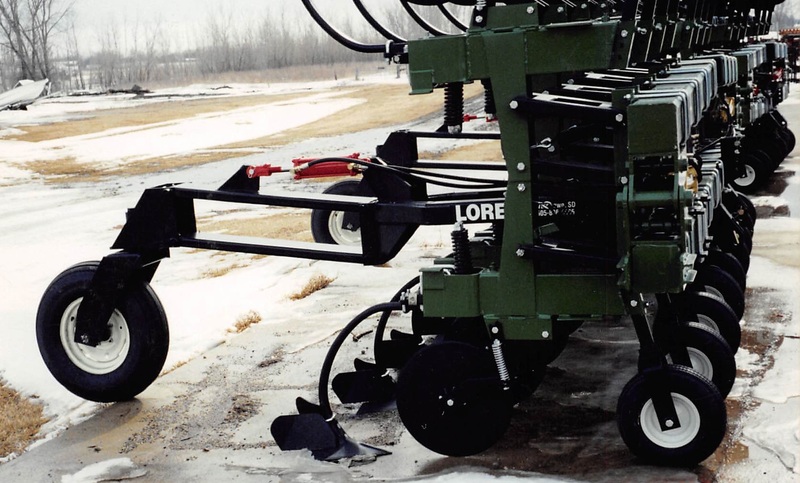 A drill or planter can attach directly to the tractor drawbar or to our optional center section, which provides for breaking of crust the entire width of the drill or planter. 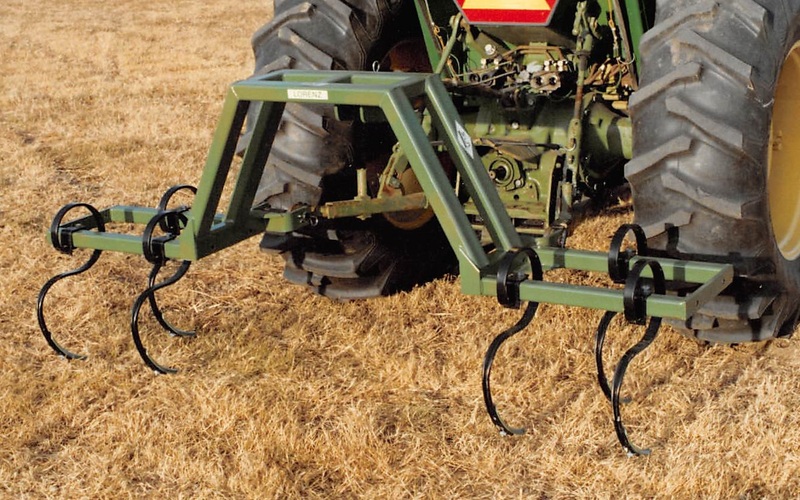 One pair of Heavy Duty Braces (7S405) are recommended with the 3 ft. and 4 ft. extensions. 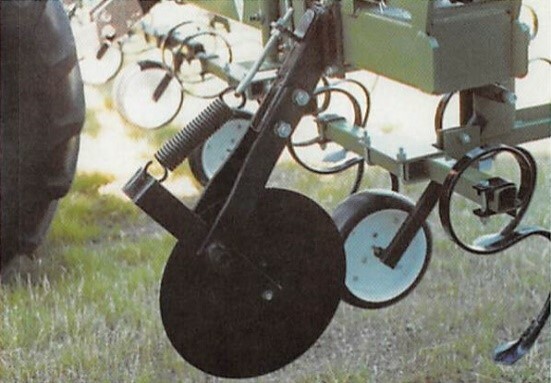 One pair of Optional Gauge Wheels (7S401) is recommended with the 4 ft. extensions. 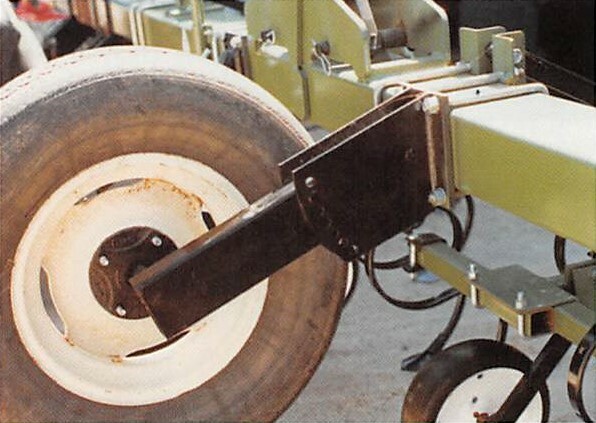 Reversible points are standard on all Wac-A-Trac models. 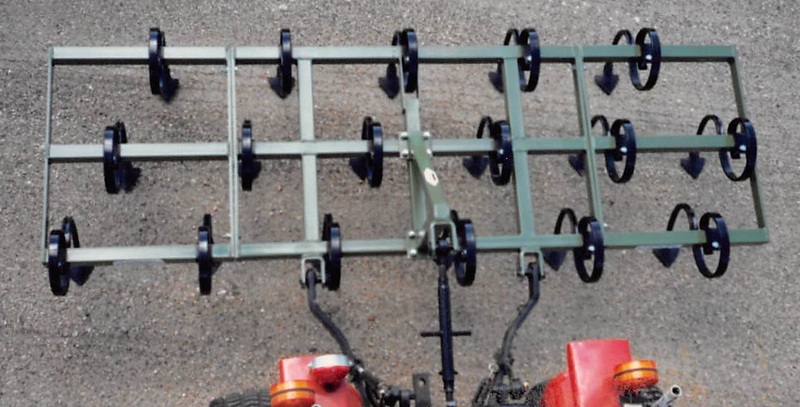 The Wac-A-Trac II covers widths from 7 ft. 8 in. to 15 ft. 8 in. 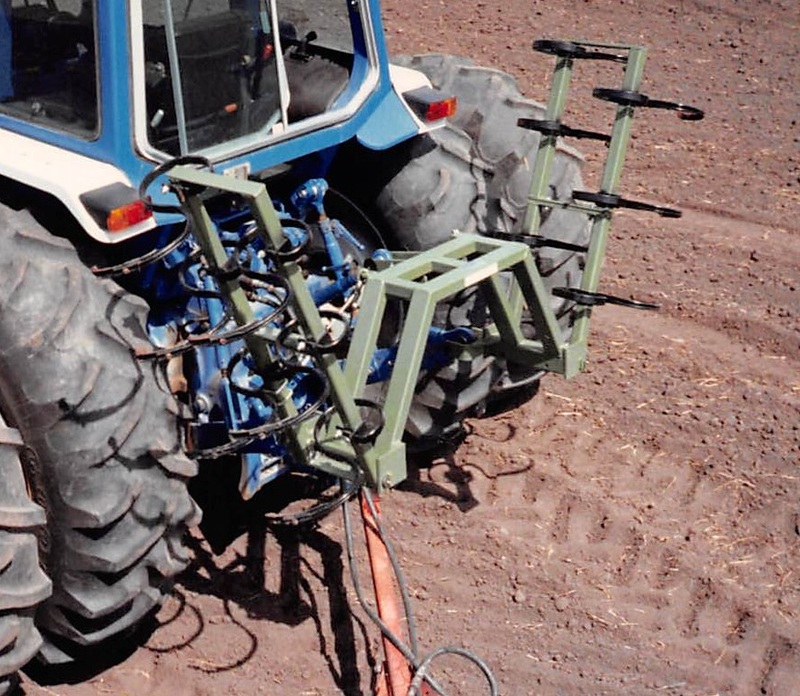 The Wac-A-Trac II is similar to the standard Wac-A-Trac, but incorporates folding wings for tighter turning by raising the wings with the standard three point, which operates a unique cable/pulley system. 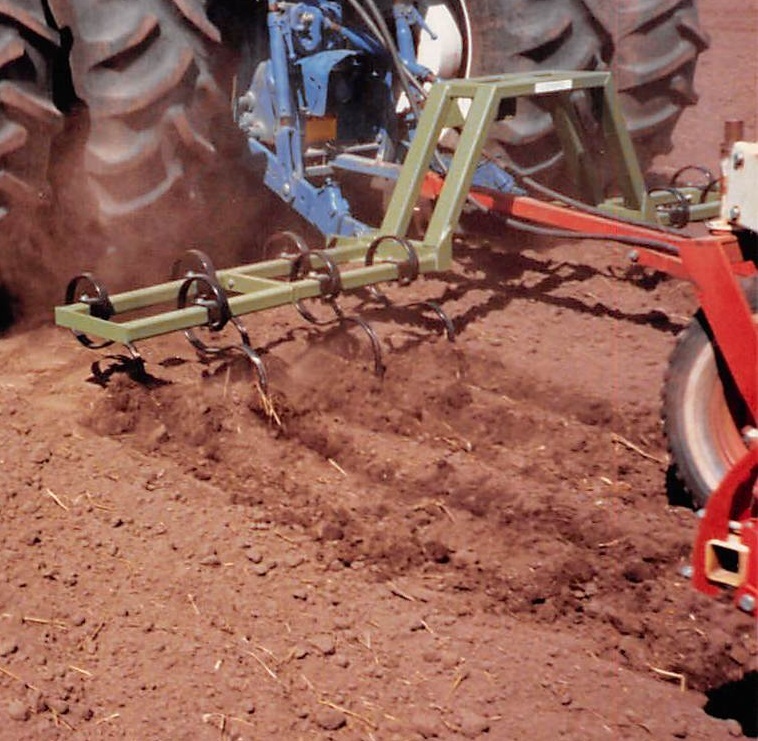 The Vibra Springtine is a good choice for all light duty cultivating. 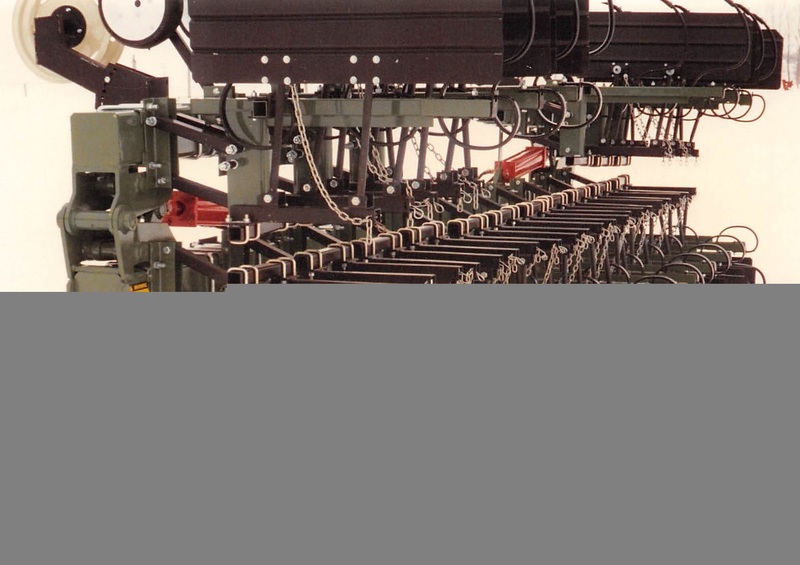 The vibrating action of the Danish Tine cuts through dirt effectively with minimum moisture loss. Five tines per inner gang is standard. 4x12 inch gauge wheel. 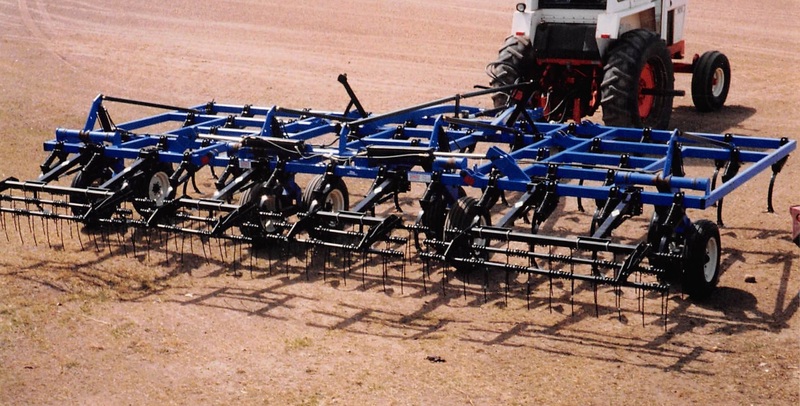 Gang spacing can easily be adjusted for any row width. 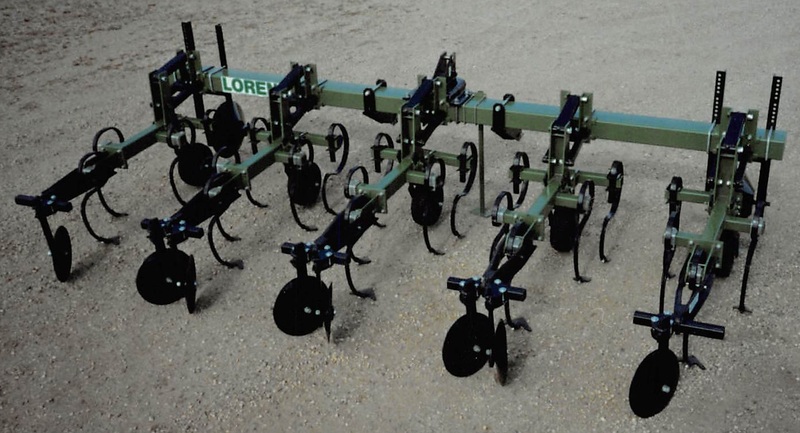 The Vibra Spring cultivator is available in non-folding 2, 4, 6 and 8 row models, and folding 6, 8, 12 and 16 row models. 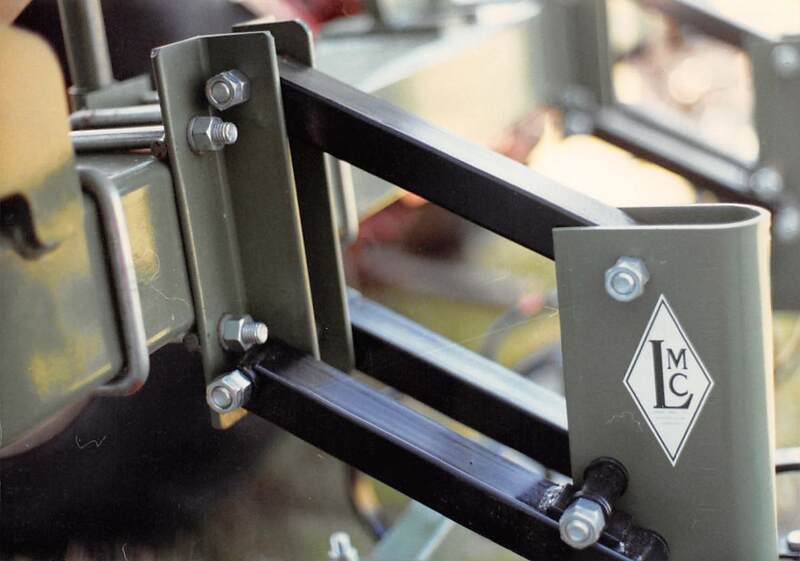 Folding models include the hydraulic cylinders and hose lengths to the center of the tool bar. Options include 2 3/4 in., 4 in., and 7 in. 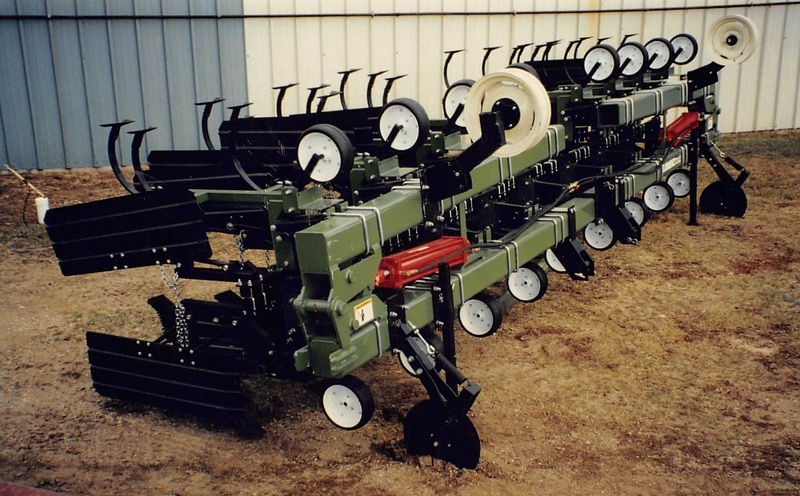 combination shovel packages. 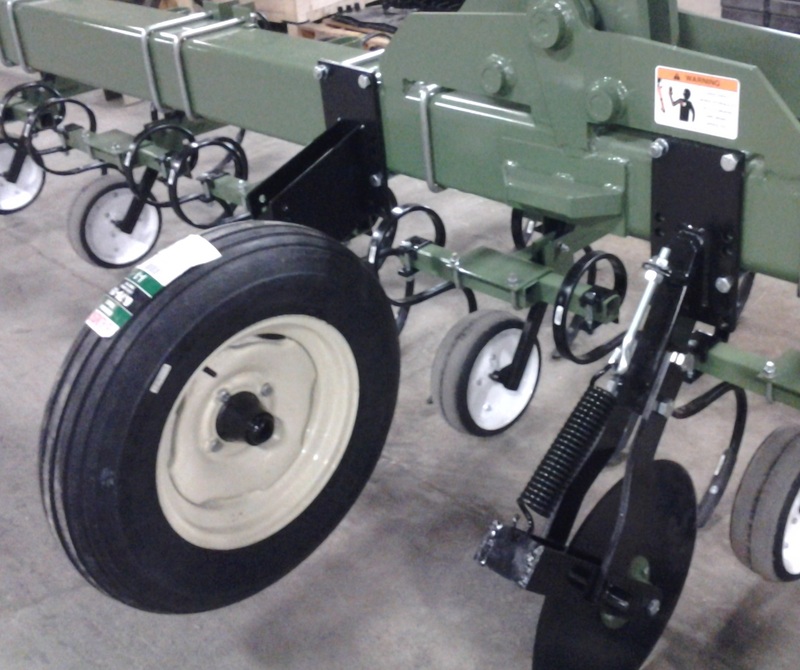 18 inch stabilizer coulter guide. Large gauge wheel kit. 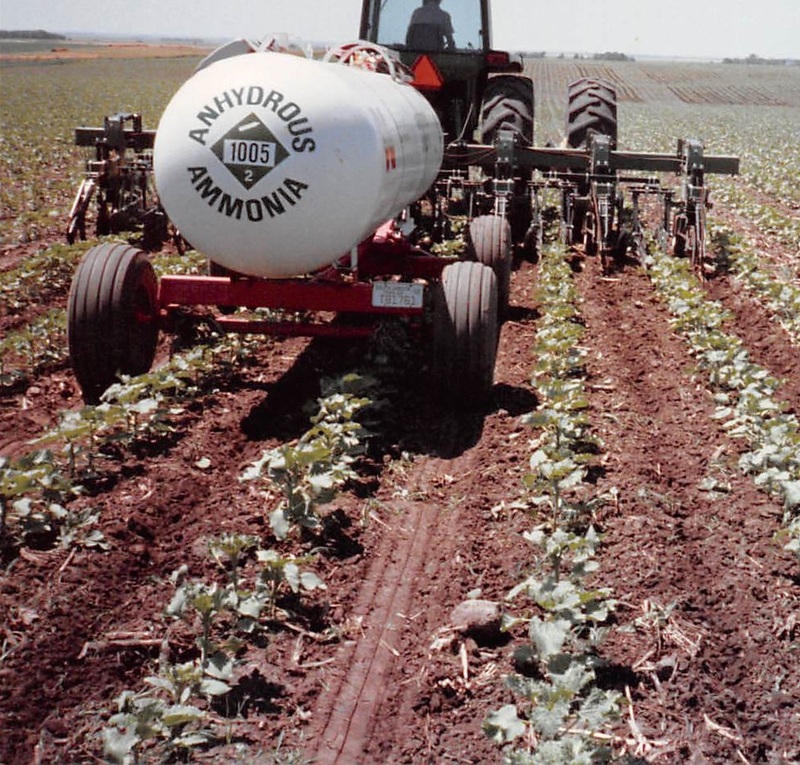 Open top crop shields. 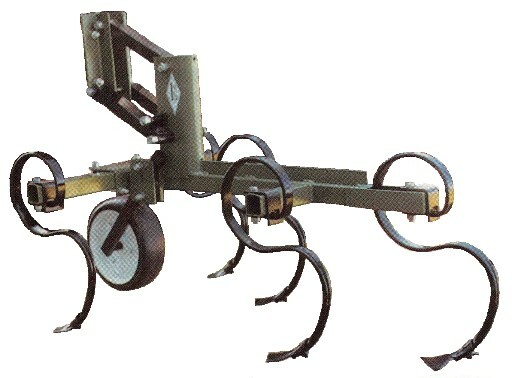 The C-Shank cultivator is similar in design to the Vibra Spring cultivator, with the exception of a stiffer shank system for medium duty applications. 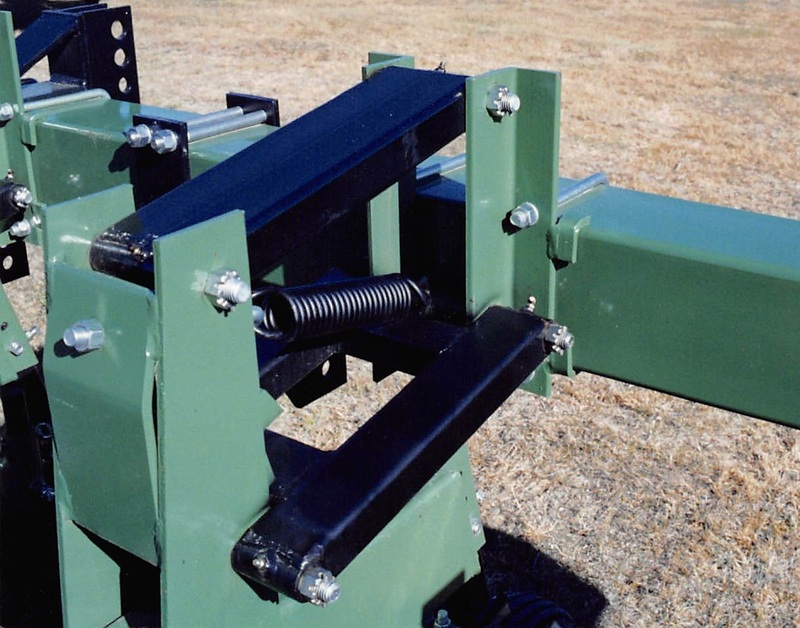 Each shank operates under a spring-loaded tension assembly to accomodated field rocks and debris. Available in 3-shank or 5-shank gang models. 22 inch heavy duty C-shank. 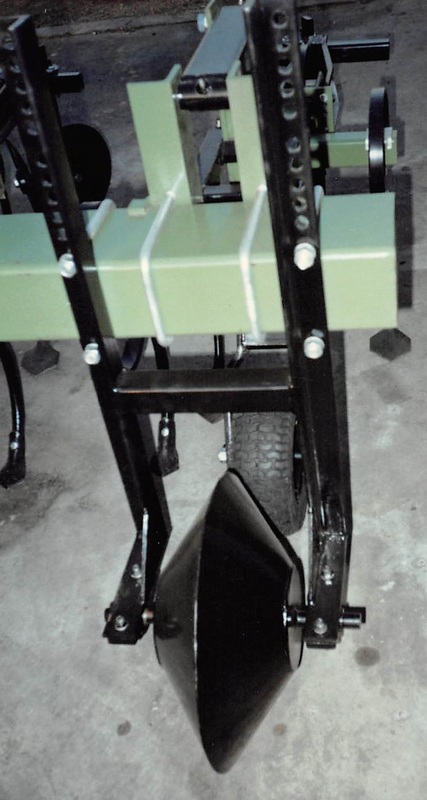 Adjustable 4x12 gauge wheel. 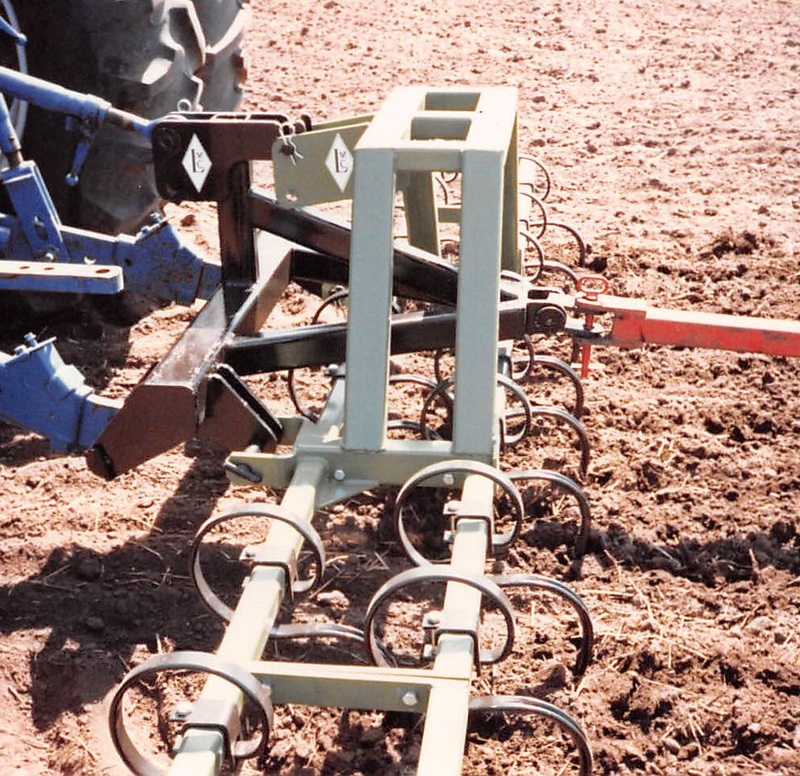 Gang spacing can easily be adjusted for any row width. 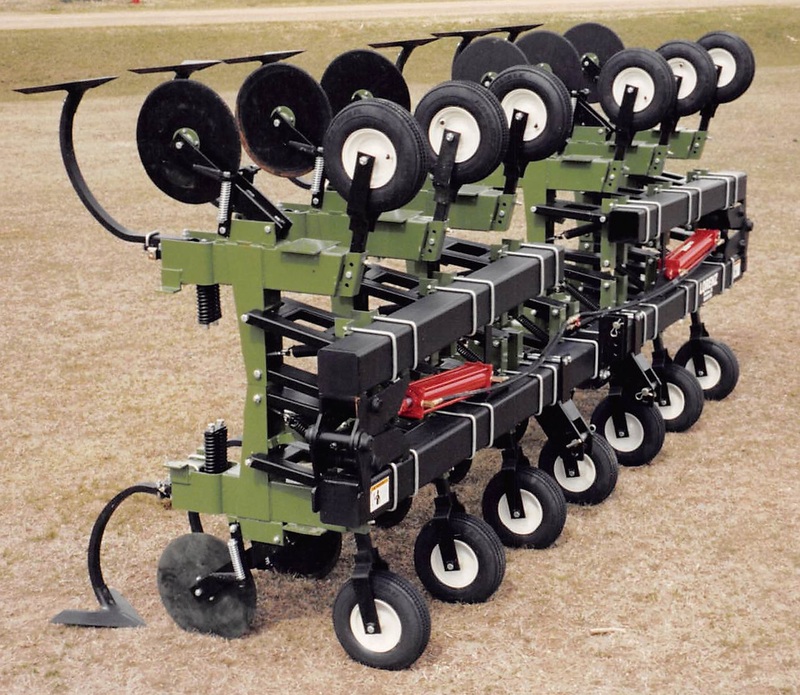 The C-Shank cultivator is available in non-folding 2, 4, 6, and 8 row models and folding 6, 8, 12, and 16 row models. 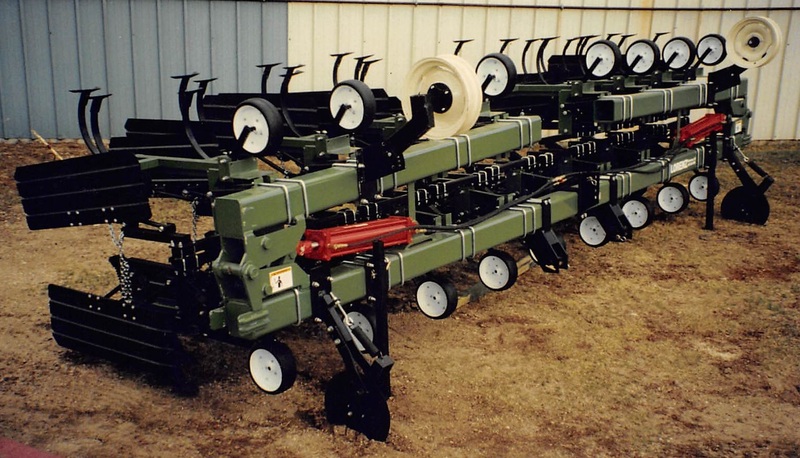 Folding models include the hydraulic cylinders and hose lengths to the center of the tool bar. 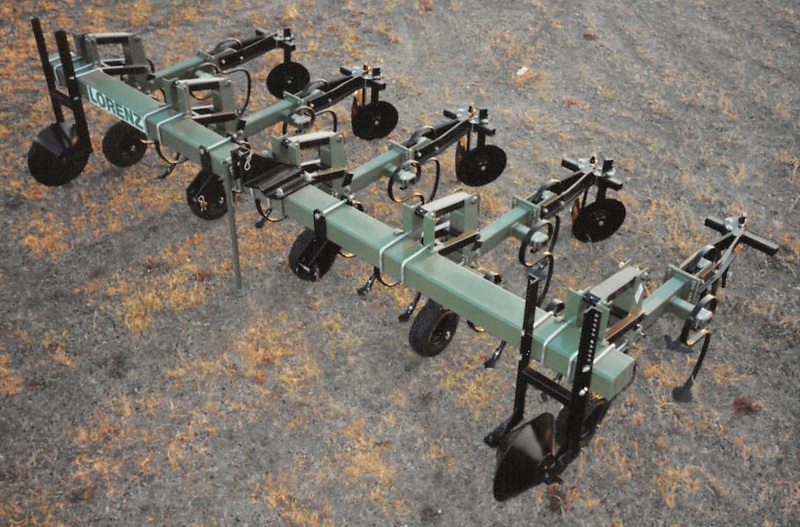 Options include various shovel sizes. 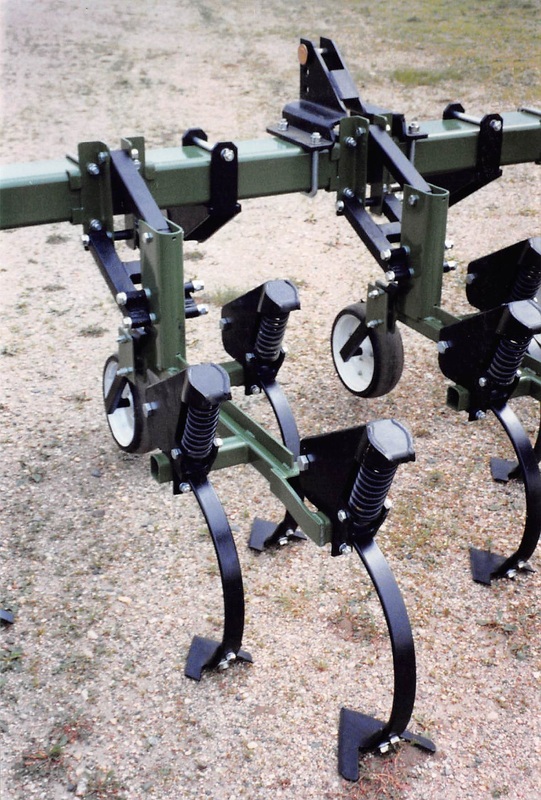 18 inch stabilizer coulter guide. Large gauge wheel kit. Open top crop shields. 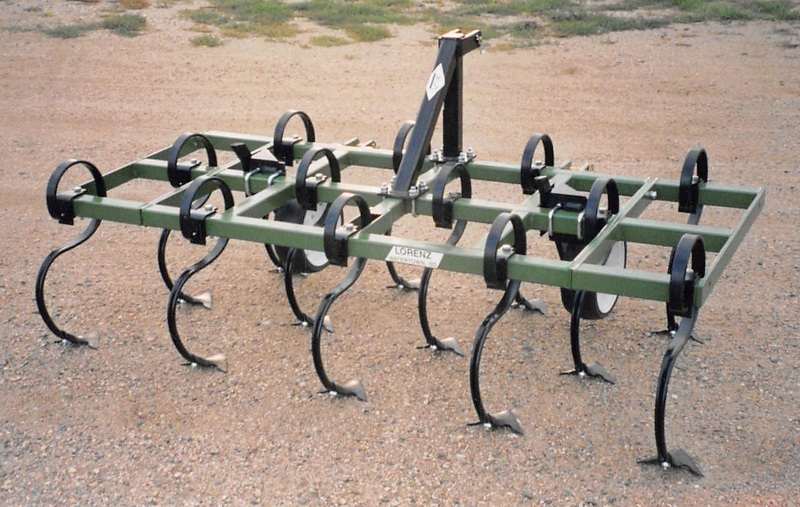 The Total Till 1400 is ideal for No Till, Minimum Till, Ridge Till, and Conventional Till applications. 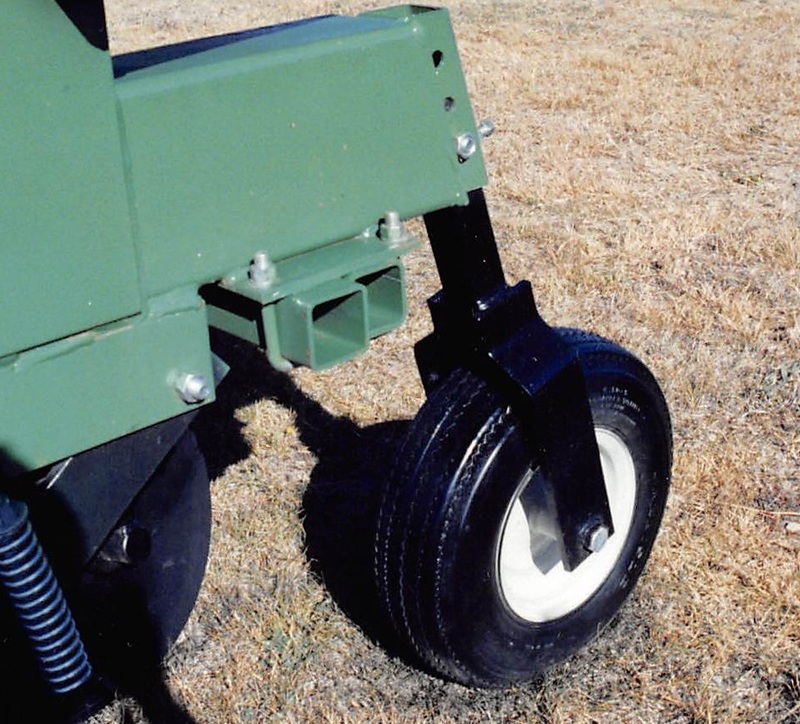 Its user friendly design consists of two adjustable 16 inch cut-away hiller discs, a 20 inch adjustable trash cutting stabilizer, and a 4x16 pneumatic gauge wheel. 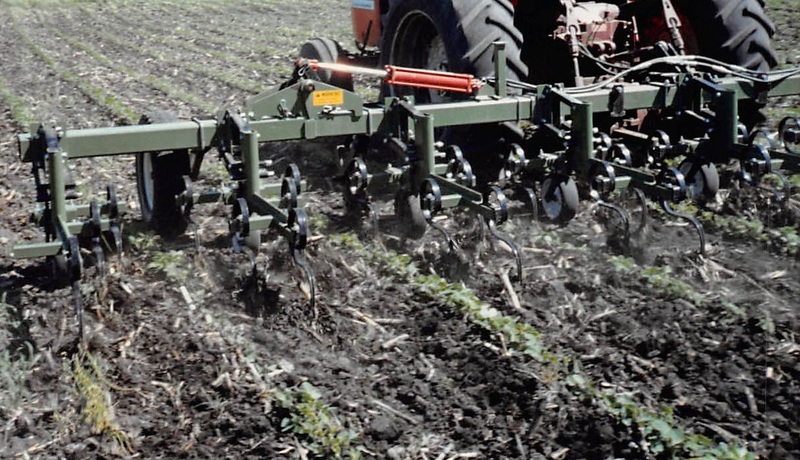 Gang spacing can easily be adjusted for any row width. 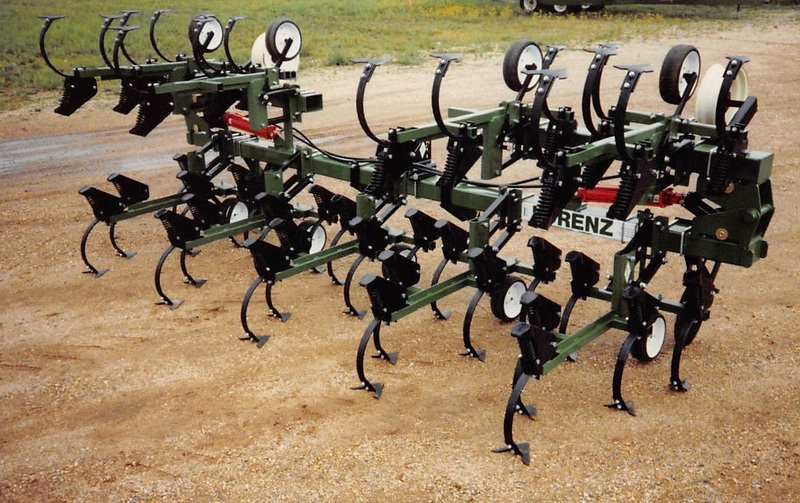 The Total Till 1400 cultivator is available in non-folding 2, 4, 6, and 8 row models and folding 8, 12, and 16 row models. 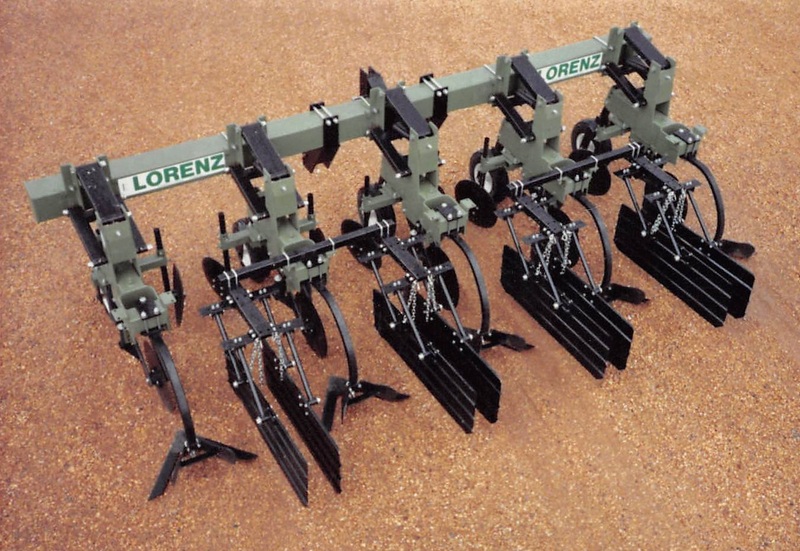 Folding models include the hydraulic cylinders and hose lengths to the center of the tool bar. 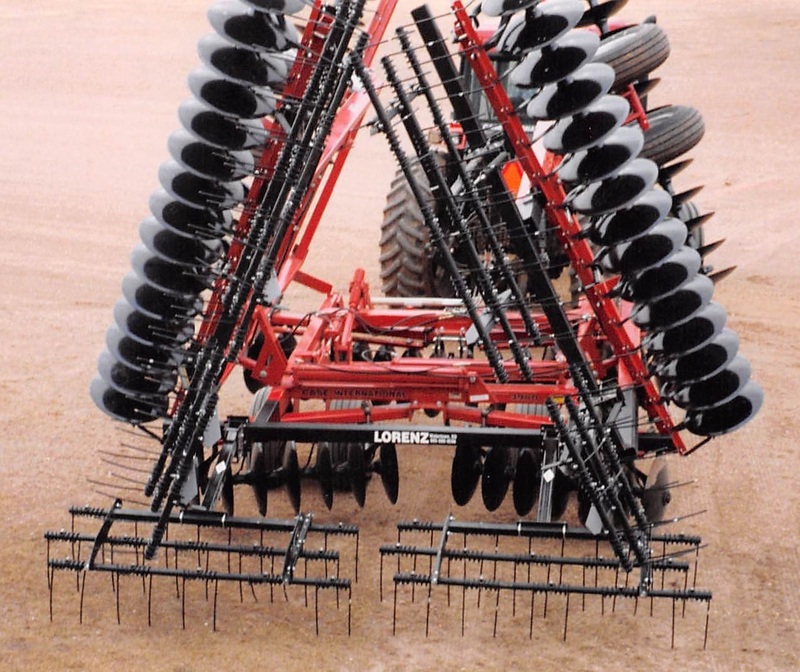 Options include various sweep sizes. Down Pressure Spring. Wing Ridger. 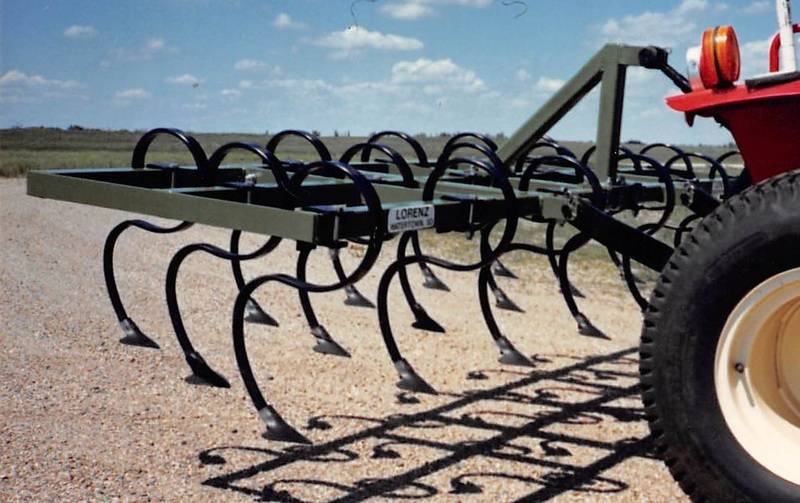 Open Top Crop Shields. Lift Assist Wheel Kit. 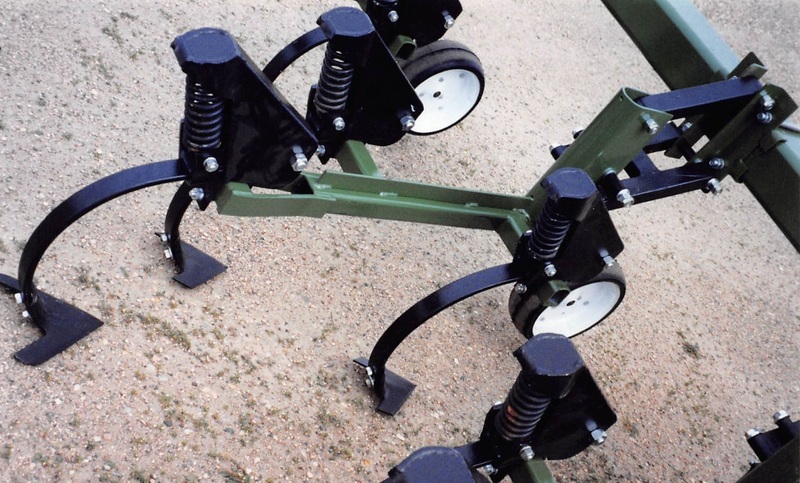 Anhydrous Tan Pull Hitch. 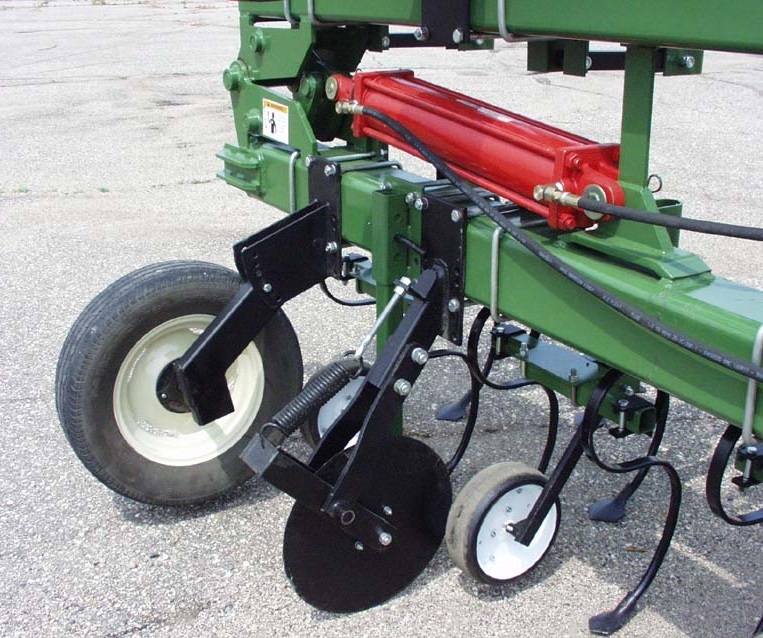 Anhydrous Knife Bracket. Slab Deflector. 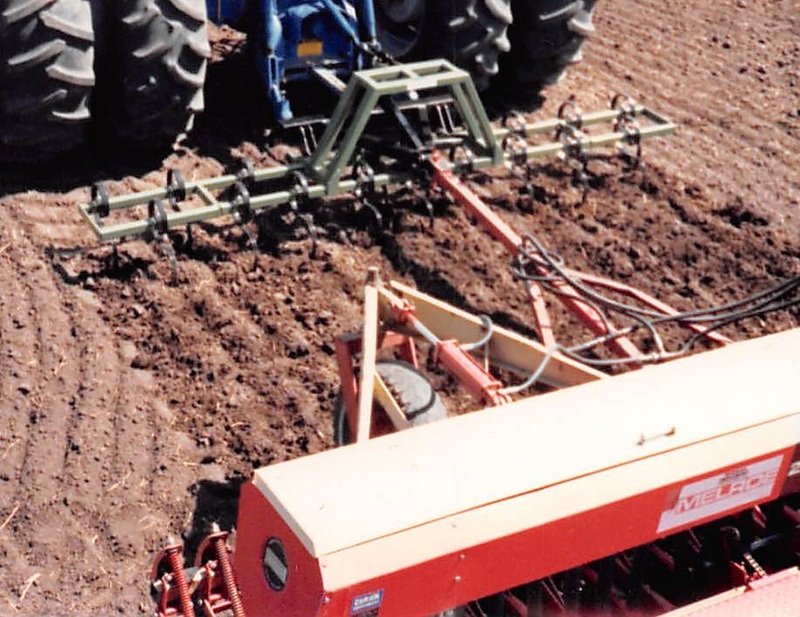 The Field Conditioner provides for excellent final seedbeds and added moisture conservation. 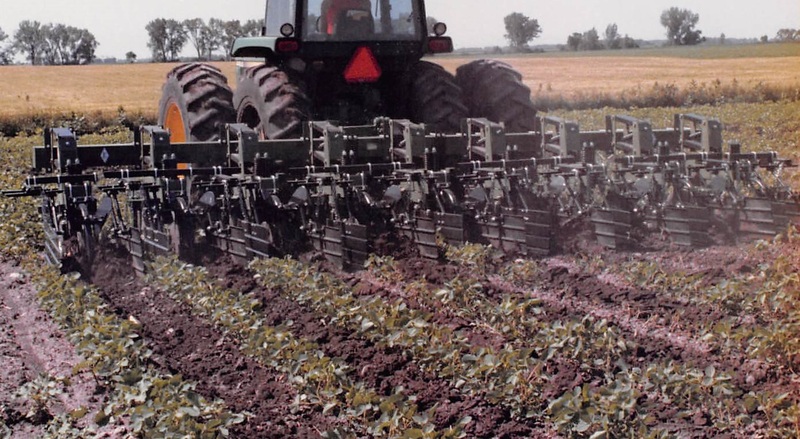 The conditioners offer good results in breaking up soil and laying the weeds out to dry. 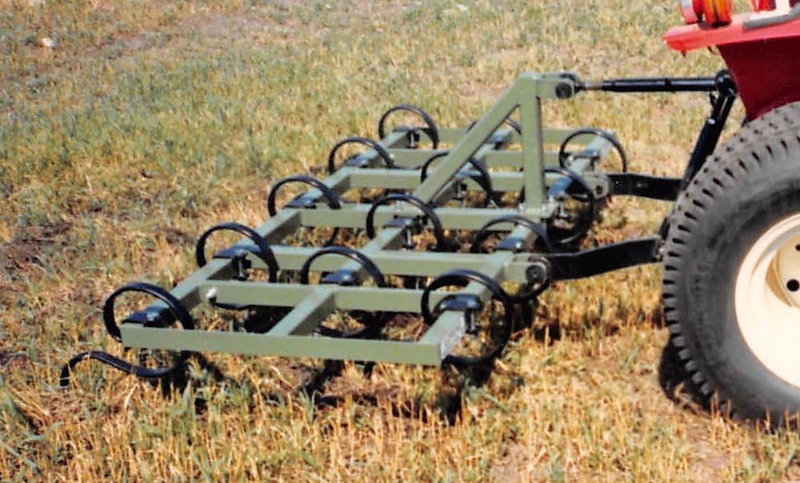 Options behind the Danish tine conditioner are either a rolling basket or tined harrow section. 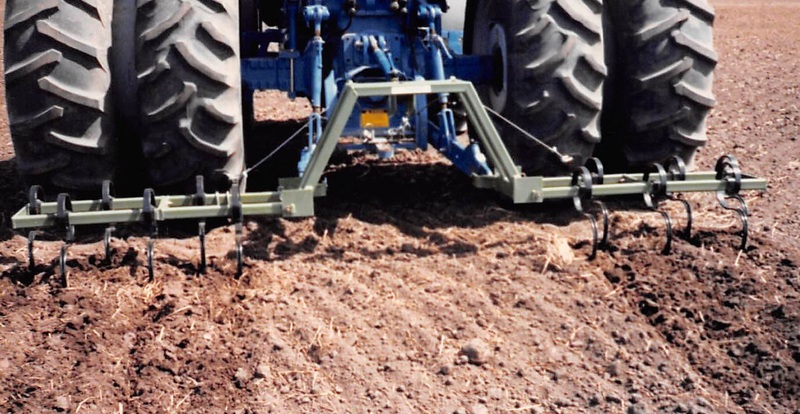 The rolling baskets prepare the seedbed by eliminating pockets of air while easily rolling over rocks. 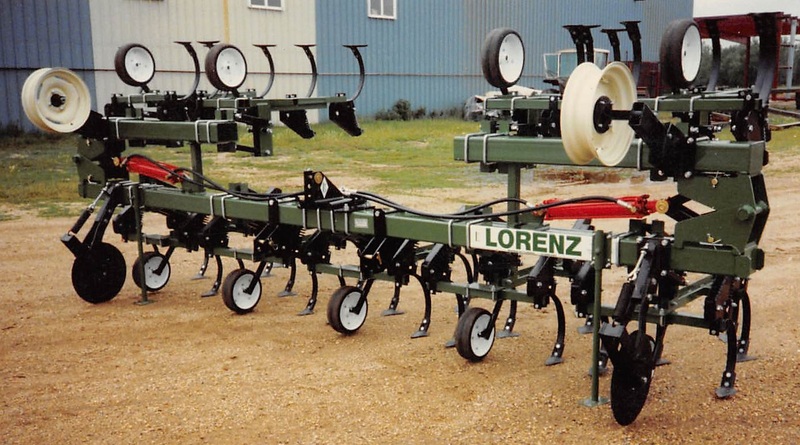 The rolling baskets are for Lorenz cultivators only. 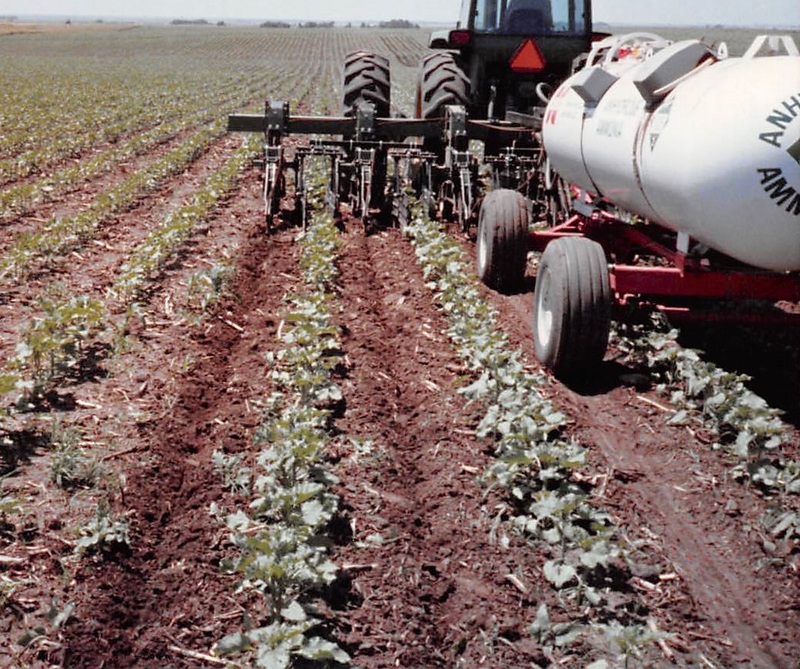 The Field Conditioner is available in 3-pt. 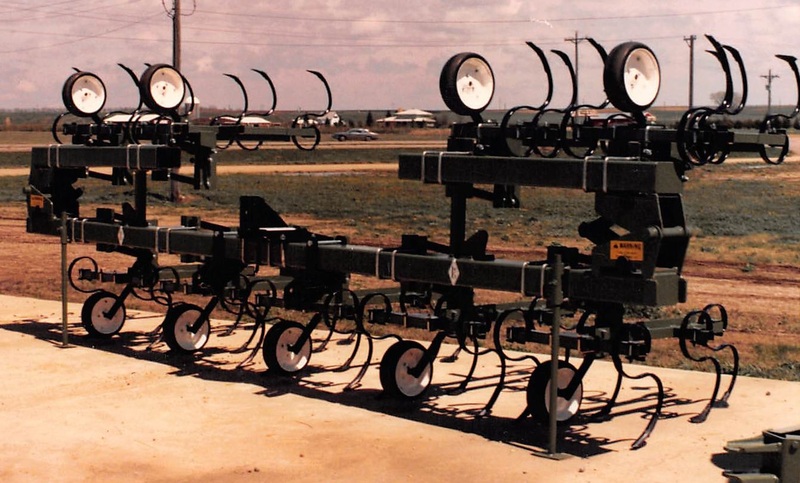 hitch or pull type models. 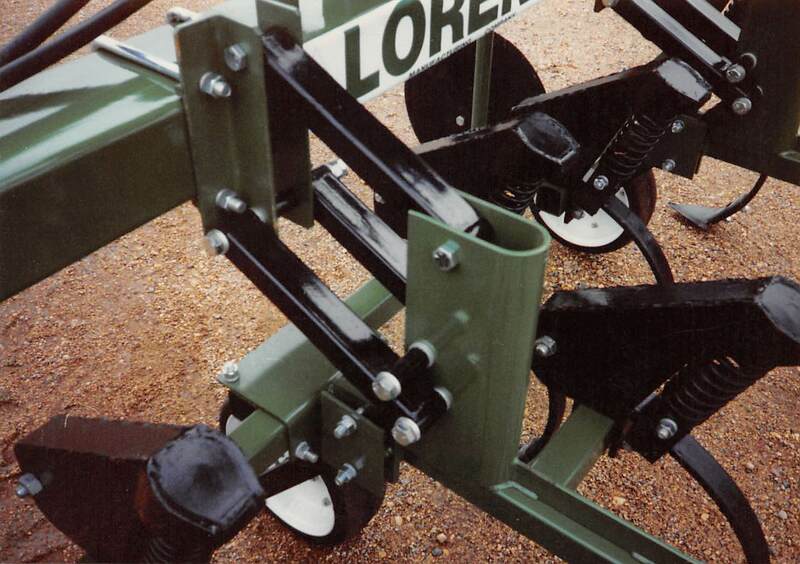 Folding models include the hydraulic cylinders and hose lengths to the center of the tool bar. Standard equipment for 3-pt. 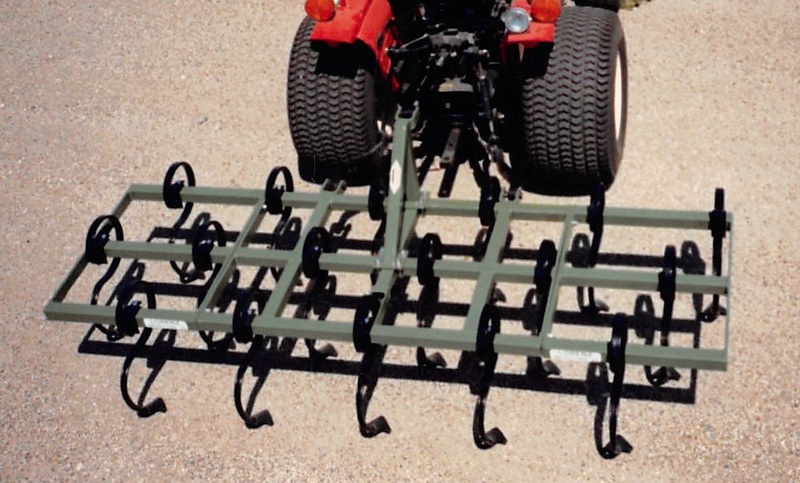 hitch models includes Standard Danish Springtines, 2 3/4 inch Goosefoot Shovels, one pair of Manual Adjusting Gauge Wheels with 15 inch rims, less tires. Optional equipment for 3-pt. 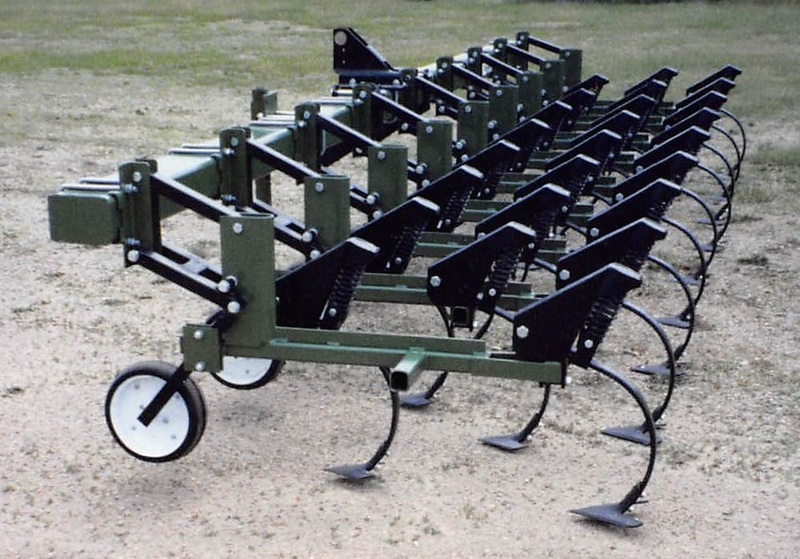 hitch models includes Heavy Duty Danish Springtines, 4 and 7 inch Shovels. 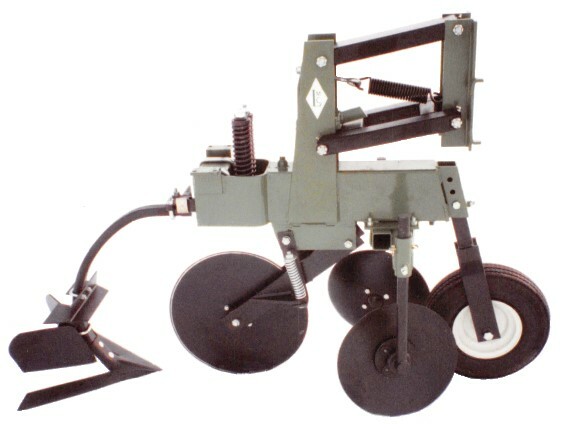 Standard equipment for pull type models includes Standard Danish Springtines, 2 3/4 inch Goosefoot Shovels, one pair of Manual Adjusting Gauge Wheels with 15 inch rims, less tires on main frame, Hydraulic Rockshaft, Pull Hitch with Radius Rod Adjustment, wing units also include one pair of Manual Adjusting Gauge Wheels with 13 inch rims, less tires on wings. 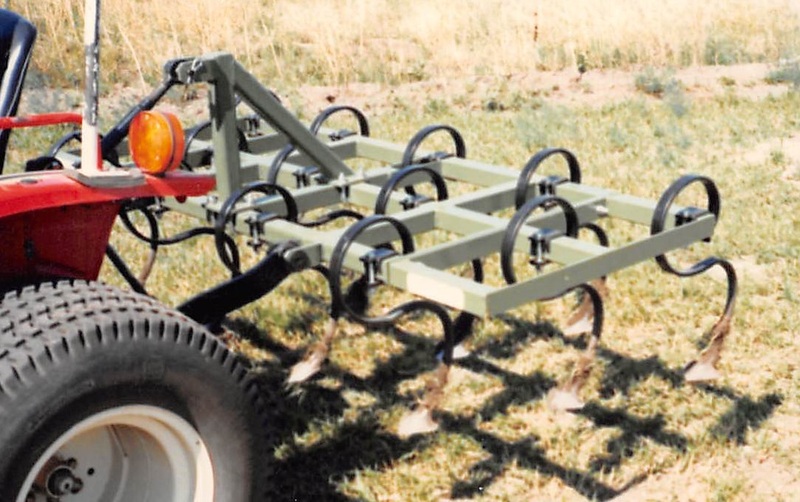 Optional equipment for pull type models includes Heavy Duty Danish Springtines, 4 and 7 inch Shovels, 4x8 Transport Cylinder Kit, 3x8 Folding Wing Cylinder Kit. 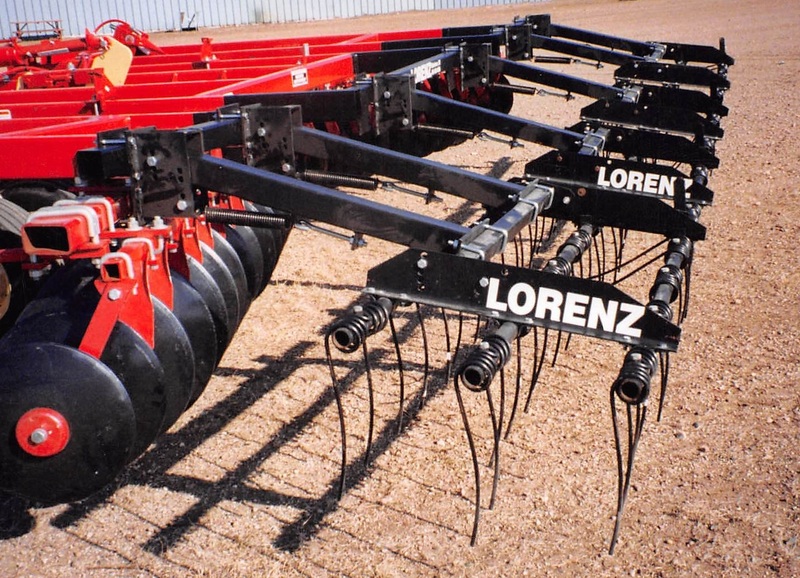 The Lorenz Harrow is available in 3-bar and 2-bar styles. 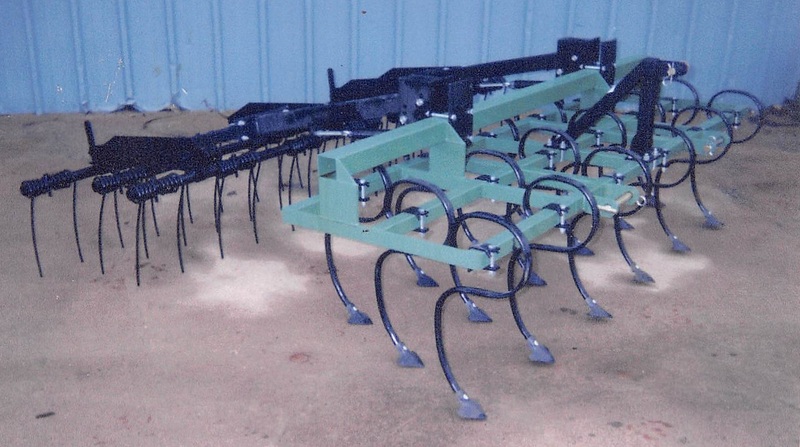 The harrow sections are fully assembled at the factory and come with one (1) spring loaded, heavy duty drawbar arm as standard equipment. 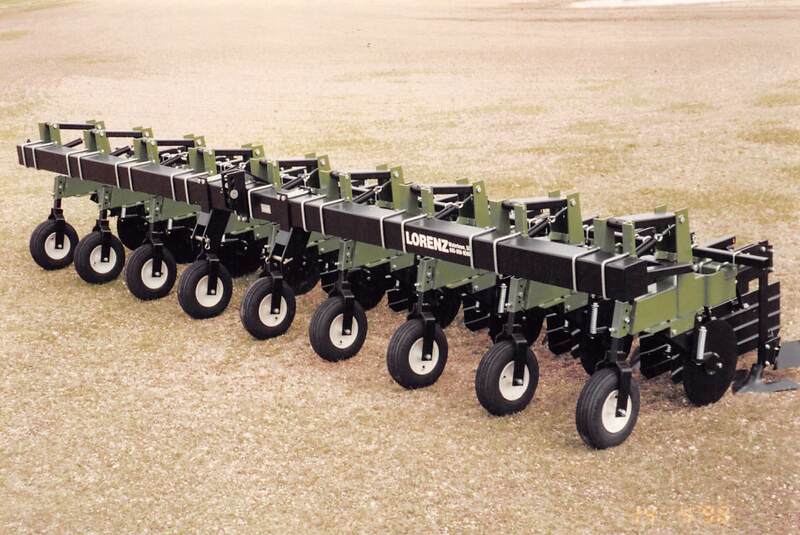 An extra drawbar arm is recommended for the LR5 and LR6 models. 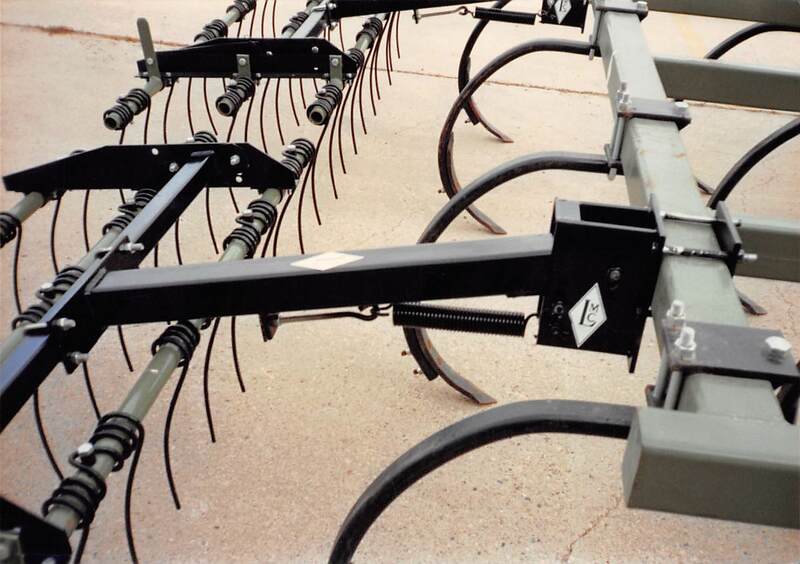 The 3/8" curved 16 inch harrow teeth allow for self cleaning upon reverse. 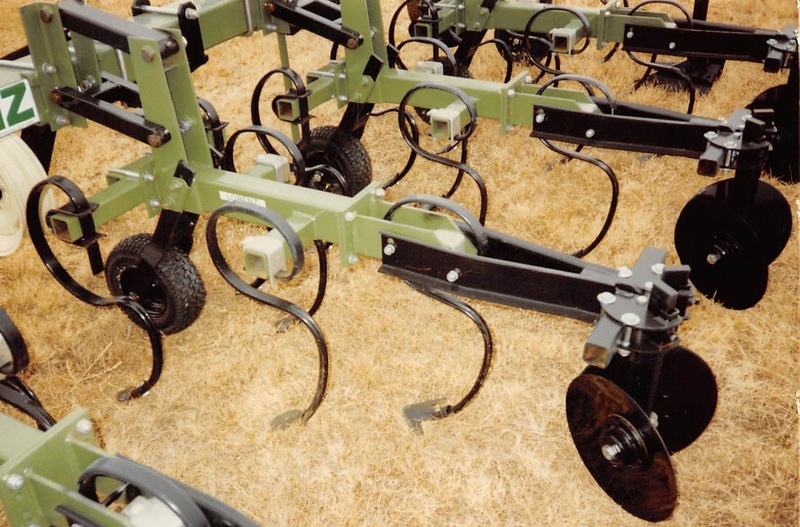 Harrow sections fit most all field cultivators and chisel plow beams from 3 to 7 inches in diameter. 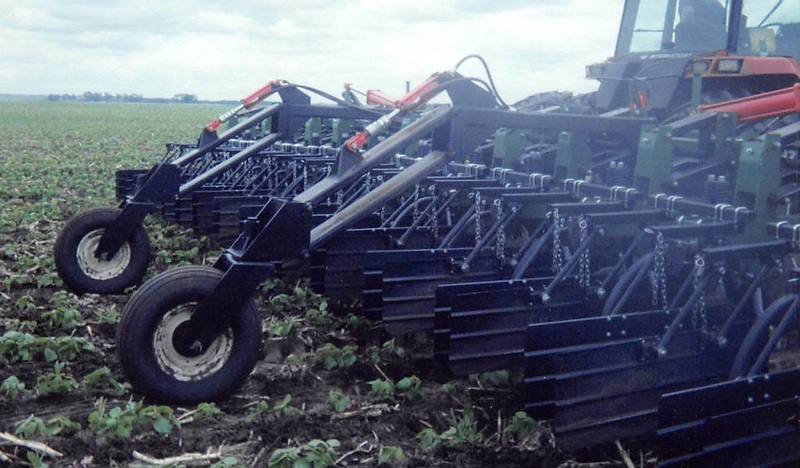 The Spud-O-Vator has a heavy 5"x 7" main tool bar with 3"x 4" gangs. 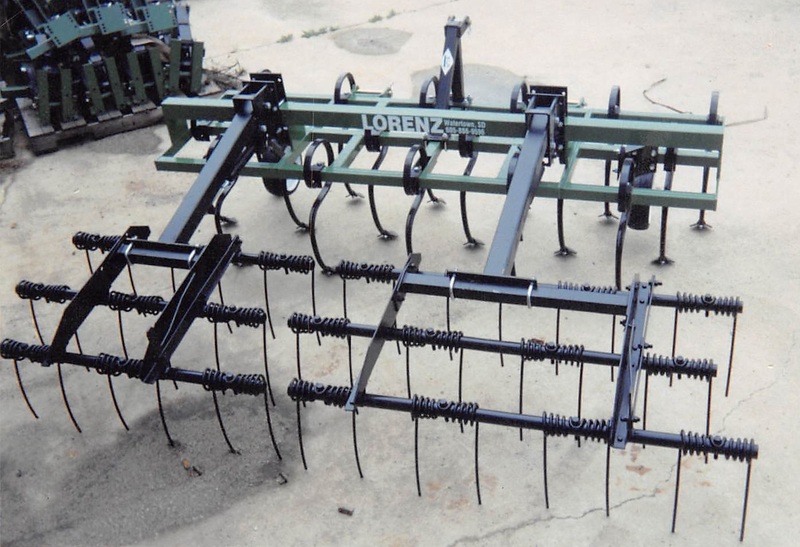 The Danish Tines are vertically adjustable, along with adjustable gauge wheels for keeping the tool bar level with the ground. 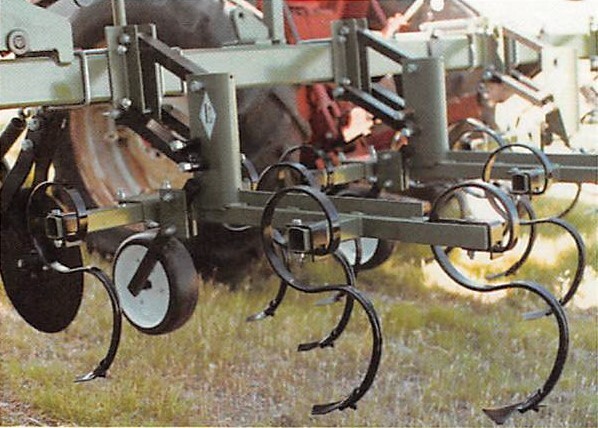 A gauge cone is offered as an option for precise cultivation. Call for sizes and options.